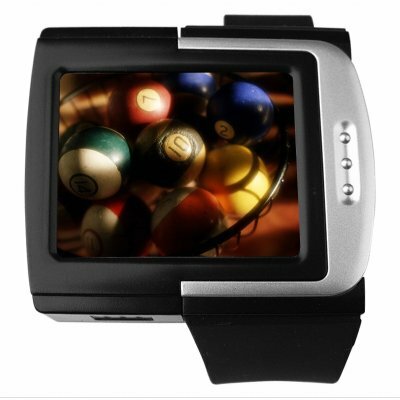 Successfully Added Cool Black MP4 Watch Player 2GB - 1.8 Inch Screen to your Shopping Cart. 2GB MP4 Player Watch specially designed to have a smooth look and feel with a cool black trim plus excellent design, and comes with a 1.8 Inch LCD Screen perfect for watching your favorite movies. It also features a recordable FM radio able to be used almost anywhere in the world, a built in high quality Speaker for listening without earphones, and adjustable time/ date/ day display. This is a great MP4 gadget to take with you when you go out, or when there is a little quiet time all to yourself, and is available with at a factory direct price from Chinavasion. Order yours today! This watch is fabulous. Speakers are very loud, top quality sound from earphones and superb quality from the screen. This watch is very sturdy too - it can take scrapes and drops unlike other watches. The only problem is the conversion CD. File sizes are huge after conversion but still top quality. This watch cannot play MP4 files, only MTV. But this watch can play almost ANY sound file (MP3, WAV, WMA etc.) and it can convert almost ANY video file too - superb watch like I said =D pick one up just for kicks.